12:45 p.m. update: The tarp is on the field as a moderate rain falls at Alex Box Stadium. No change in schedule as of now. 1:35 p.m. update: The rain is lighter, but the tarp is still on the field. A game official just stepped in to say we still hope to have a first pitch of 2:04 p.m. They’ll need to start pulling the tarp soon to make it happen. 1:43 p.m. update: We are going to be delayed. The plan is to pull the tarp at 2 p.m., give the players a chance to warm up and then we’ll be underway. The collective brain trust in the Rice radio booth is guessing a 2:30 p.m. first pitch if there are no further delays. Again, this is our guess! 2:15 p.m. update: The tarp is being pulled off the field. Still no official start time, but things are looking up. 2:25 p.m. update: First pitch is scheduled for 2:45 p.m.
Rice and Texas Southern, with campuses just miles apart in Houston, will play today at 2 p.m. to stave off elimination and an early ride back to the the Bayou City via I-10 west. Head coach Wayne Graham announced late last night that sophomore Zach Esquivel will take the mound for the No. 3 seed Owls today as they try to tame the No. 4 seed Tigers. Watch online via ESPN3.com, listen to the Rice radio broadcast or follow the live stats here. The last time the Owls and Tigers faced off was in May 2012, when the Owls rallied for six unanswered runs, including the game winner in the bottom of the 11th inning, giving the Owls the 6-5 victory over the Tigers at Reckling Park. The updated weather forecast for Saturday is more promising than initially thought. According to The Weather Channel, the chance for rain at 2 p.m. is 30 percent and increases to 60 percent by 5 p.m. Fingers are crossed that we will play a full, uninterrupted game today. On this date in 2013, Rice won its last NCAA Regional championship. Facing possible elimination in a one-game championship final, Rice came up with one of its best performances of the year to defeat No. 9-ranked Oregon on the road 11-4, claiming the Eugene Regional title. 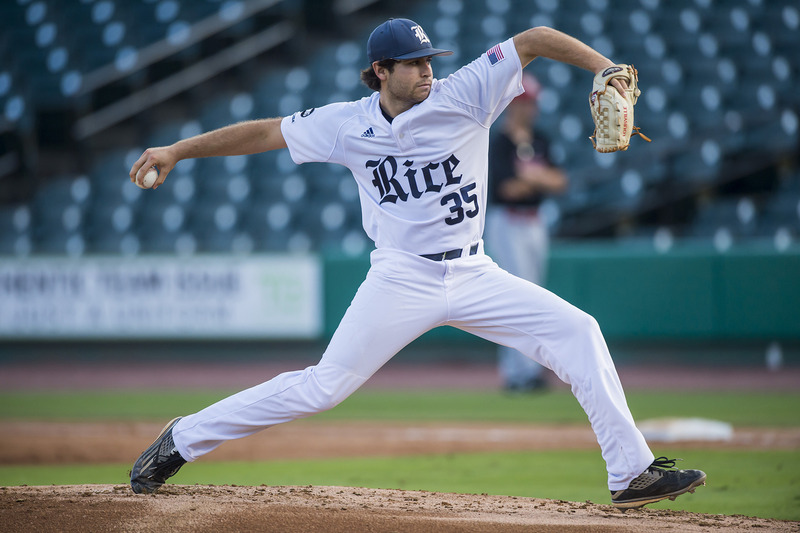 Prior to, during and after the game, follow the team on Twitter @RiceBaseball and “Rice Athletics” on SnapChat. We’re getting ready to leave the team hotel shortly for LSU’s Alex Box Stadium. We may have a few more updates to this post once we get set up in the press box.